We were at the actual Stonehenge for about an hour, enough to walk around the site and say I had been there. I was given a audio player but I was a little too distracted by all the sheep near by to listen-haha. Bath was absolutely beautiful though, its a charming town with a population of around 80,000 and architecture that dates back to the 15th century. We started out at the original Roman baths which was beautiful and then had time to go explore around the city. It was such a relaxing Sunday to just roam around this peaceful area and not be in such a hurry. A couple of us girls went to the 'Bath Tub' cafe for lunch which was right over the river that runs right down the center of the town. We wandered up to the circus which was were a majority of the original townhouses are placed in a crescent formation facing out into the country. 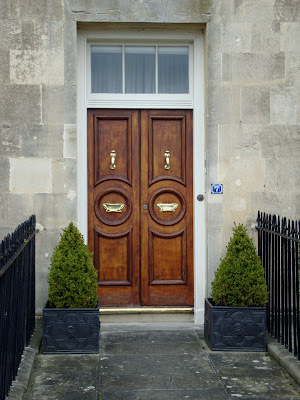 As usual I found some picture perfect vintage doors--I'm just waiting for the day when I snap a picture of someone's entrance and they come out right when I am doing so--oops! This day trip was the perfect way to spend my Sunday after a busy week of working and catching up on schoolwork. 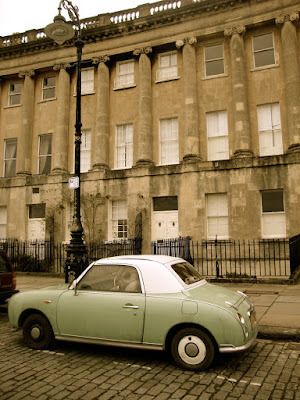 If I had my way--I'd spend every Sunday in Bath. Just saying that makes me feel relaxed and unstressed already.